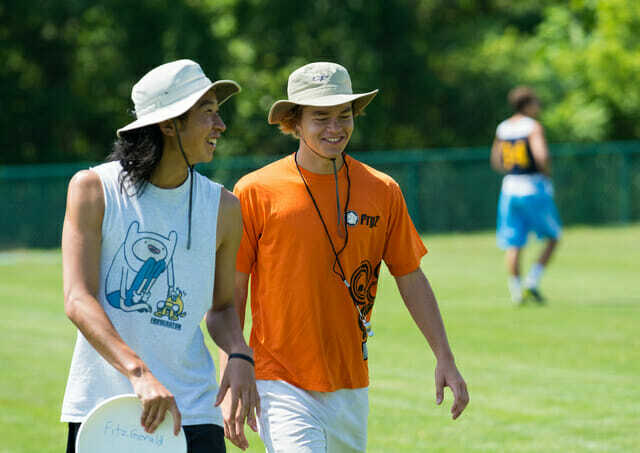 The National Ultimate Training Camp offers a cross-section of some of the finest young talent in not just the United States, but from around the world. Eli Motycka interviews Meg Goldbuch, coming to NUTC from Germany, about her experiences at the camp. For the month of July, I fall down the rabbit hole of NUTC. Camp is all-consuming but I wanted to give you all a quick peek into the lives of our campers and counselors. Below is an interview with Meg Goldbuch, a camper at NUTC from Germany, conducted by Eli Motycka, a counselor this year. Both Motycka and Goldbuch are competing at WJUC this week in Lecco. Eli is on the USA team for the second time and Meg is representing Germany on their U-17 team. We wish them both the best of luck! Wesley Chow and I had the privilege of coaching Meg (from Leipzig, Germany) this past week at NUTC. She has fantastic disc skills, field vision, work ethic, and attitude, but the best thing for me was that having Meg at camp made the ultimate community smaller. Getting to know a German teenager who loves ultimate and is hilarious and fits in so easily with kids halfway across the world makes her seem like one of the many ultimate friends you’ll bump into at a tournament and catch up with like no time has passed. I’m fortunate enough to get to do that in Italy this week, and I’m happy for the sport and future campers and counselors that the Phillis scholarship will bring over another camper every year. Props to the Japanese national teams whose motto “sport is the best way of communication;” it lets me know they already have it figured out. When did you start playing ultimate and what brought you to the sport? I started playing ultimate in 2011. There was a kid in my class who played ultimate, a friend of mine who asked me to come to practice with her and said she is often the only girl, and I do other sports so I didn’t want to. But sometimes I went with her because it was on the beach, by a lake, two minutes from my house. I liked the people there, I enjoyed playing with them and had fun and it was cool, so I decided to keep going. How did you learn about NUTC? There is an award in Germany that sponsors a trip for one person each year to go to NUTC, it sounded cool so I just applied. It’s the Phillis Award. [Phillip “Phillis” Timmermann] was a guy who played ultimate in Germany. He died from a brain tumor so friends and family wanted people to remember him and so they founded this award for international ultimate juniors. When you compare ultimate in Germany to ultimate in the US what are major differences or similarities you’ve noticed? I think it’s a higher level here. For example, I think at least two of the other girls at camp with me would make it on the under 17 team in Germany because there just aren’t as many players in Germany. It’s also different because they’re all players from high school and they just do it for part of the year. In Germany, when juniors begin to play, they mostly practice one, two, or three times a week and play all year around, because we play indoor ultimate and there’s an indoor national and indoor junior championships. You’re with the same team for the whole year and there’s not so many club teams that one person plays for different ones and stays for a whole season, not just one tournament. What’s been your favorite part of camp so far? I like that NUTC makes teams, just so you have a smaller group and you don’t have to learn everyone’s name (laughs). It’s just like a team, even if you just know them for two days or so. Is there anything that’s surprised you about NUTC? I thought it would be a bit more high level. There are a lot of newcomers. Maybe it’s because if you had this many juniors in Germany at least half of them are national players. There are so many players here. What’s something you’re going to remember about NUTC? I like the counselor and camper relationship and the whole mentality between counselors and campers. I like that when Tiina talks all the campers are quiet and listen to her because she says things honestly and tells campers that we won’t accept if you say something that could hurt someone else. I think that’s pretty cool because in Germany there are a lot of junior players who are just like, “I am the best on my team, I’m the best,” and I think it’s important to have fun when you play. You don’t have to punish the other team just because you won the game. I’m very thankful that I can be here—very, very thankful. And I would like to come every year. Yeah. It’s a really great thing. And maybe in Germany you can start a camp. (laughs) Yeah. That would be cool. 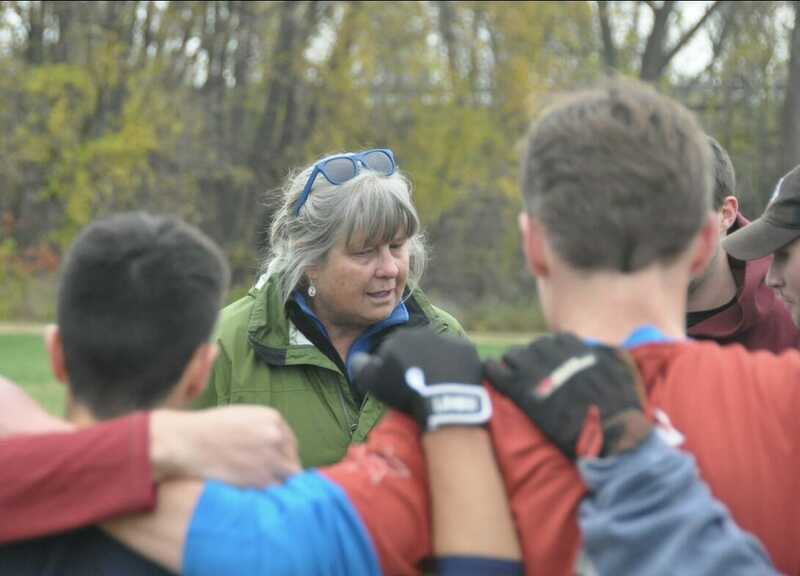 Tiina Booth is the director of the National Ultimate Training Camp and a co-coach of the University of Massachusetts men. She founded the Amherst Invitational in 1992 and co-founded Junior Nationals in 1998. In 2006, she published a book about ultimate with Michael Baccarini, entitled Essential Ultimate. She has coached teams to numerous national and international titles. Her ongoing passion is sports psychology, and she offers clinics to coaches of ultimate and other sports. Tiina will be inducted into the Ultimate Hall of Fame at USAU Club Nationals in October of 2018. Comments on "NUTC Chat 2014: Meg Goldbuch & Eli Motycka"